Bone broth. You may have heard it hailed as the new superfood or read stories about hipsters lining up on city streets to get their morning cup of hot bone broth instead of coffee. But what is it? Isn’t it just, like…broth? Why do people care? We’re here to hold your hand and walk you through this brave new world of broth. Buckle up and get ready for the ride of a lifetime as we explore the whats and whys of everyone’s favorite new broth. Bone broth is, well, basically exactly what is sounds like. Bones, often with a few aromatics, are simmered in water to yield a rich, nourishing broth. How is it different from regular broth or stock? There aren’t any real technical distinctions between bone broth and regular broth or stock, but there are a few differences. Broth is usually a lighter-bodied liquid made from simmering meat, sometimes on the bone, in water with aromatics for one or two hours. Stock is usually made with more bones than meat and some aromatics and is usually simmered for longer than a simple broth. This extracts more gelatin from the bones and meat, leading to a liquid with more viscosity than a simple broth. Bone broth is made with bones (beef, pork or chicken), especially those that are high in collagen. Knuckles, marrow bones, feet, tendons — these cuts might not be ones you’d choose when deciding what to cook for a dinner party, but after a long simmer, they make for a super-flavorful broth with tons of body. Bone broth is also usually simmered for a long time — it’s not unheard of to keep the bones cooking for 12 hours or more. The resulting broth is extremely rich in gelatin and will probably firm up into a jelly-like texture when cold. Bone broth is touted by some as a miracle cure-all. I wouldn’t necessarily hitch your wagon to that star, but bone broth does contain many nutritious vitamins, minerals and amino acids, along with collagen and gelatin that some believe can help ease joint pain. More compellingly, it’s a rich, warm, flavorful broth that just tastes good. In the cold winter months, sometimes a savory cup of bone broth is just the thing to shake off the chill. 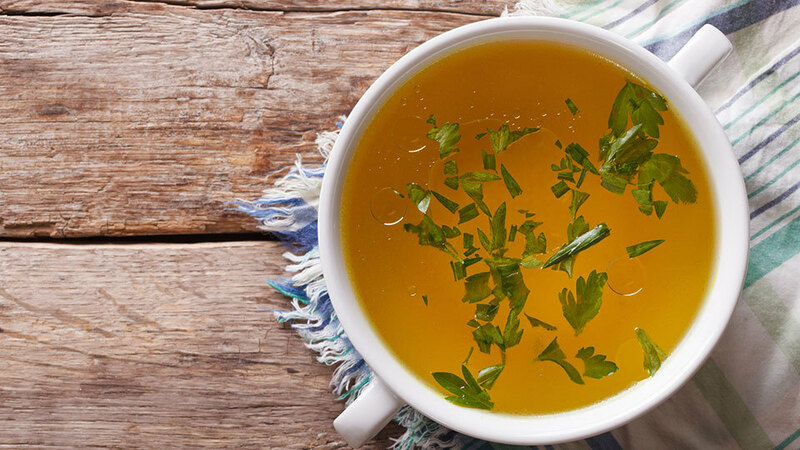 What sets great bone broth apart from good bone broth? Here are some tips for making your broth taste as good as possible. Blanche your bones. If you’ve ever made stock at home before, you may have noticed some white or gray-ish foam rise to the top as it simmers. 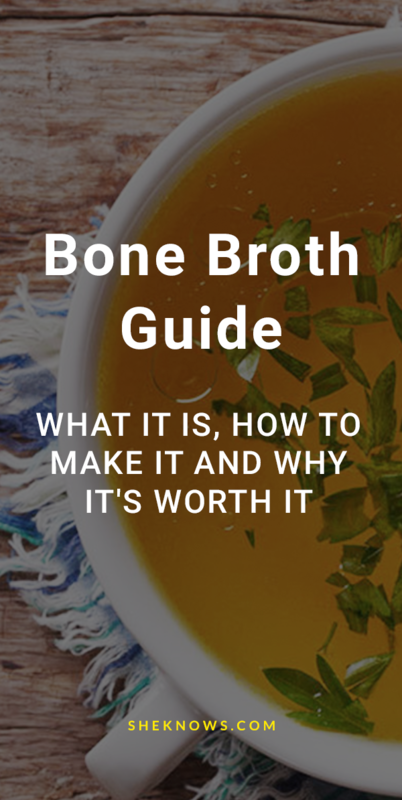 Bone broth, since it simmers for longer and tends to use bones that have, well, more “going on” in them, can be especially susceptible to this foam, which can give the broth an off flavor. To avoid this, blanch your bones before you start cooking. Simply cook them at a low boil for about 20 minutes, skimming off foam as you go before draining and proceeding with your recipe. Roast your bones. To really amplify the rich, meaty flavor of your broth, you should always roast your bones. It’s a simple step that adds tons of dimension to your finished product. Crank your oven up and roast your bones until they’re deeply browned. When they’re done, don’t forget to deglaze the roasting pan with a little water and use that liquid in your broth base. Simmer it for a long time. These roasted bones are full of flavor and should be simmered for a long time to extract all of it. Bone broth should be simmered for as long as you can stand it — at least four hours — to make sure that all of the collagen and gelatin has broken down and infused the broth, but preferably anywhere from 10 to 12 hours or longer. Cool it quickly. That large vat of stock will take a long time to cool down if you just pop the whole thing in the fridge, meaning harmful bacteria will have ample time to flourish. Instead, you should pour your bone broth into one or two shallow roasting pans along with a few handfuls of ice, stirring it occasionally until it’s reached room temperature or cooler, then pop in the fridge to safely cool the rest of the way. And how can you make your broth? On the stove. The classic method for making bone broth is on the stove. Add your roasted bones, a few aromatics (think onion, bay leaf, maybe a carrot, a stalk of celery and some leek) and a lot of water to a large stockpot. Bring it to a boil, then lower the heat and simmer it until you’re satisfied with your broth, adding more water if too much boils off. In the oven. Add your roasted bones, aromatics and water to a Dutch oven. Bring it to a boil on the stove, then cover and cook in a 200-degree F oven for 12 or more hours, adding more water if necessary. In the slow cooker. Add your ingredients to the slow cooker, then set it to high. Once the ingredients in the slow cooker start to bubble vigorously, set the slow cooker to low heat and let it cook for 12 or more hours. In a pressure cooker. Yes, you can make bone broth in the pressure cooker. It’ll cut several hours off your cooking time. What are some other ways to try it?